Most of us spend most of our work time focusing on the "things" that make up our product or service: the features, the words, the sounds, the icons, the buttons, the graphics, the content and so on. We try to define and control every aspect of the user's experience. Every moment of the user's experience. But what if the non-things--the space between the things--is just if not more important? A few years ago, I went to a [John Dodds, you might want to cover your ears for a moment] Travis concert (British indie-rock band). 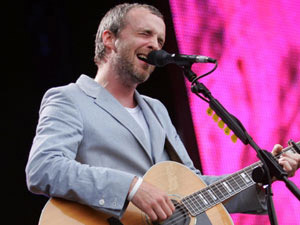 In the midst of the show, front man Fran Healy (known in the US for wearing a utilikilt on the Letterman show) talked about a concert he'd been to the night before, at Red Rocks Amphitheater. "These guys are so natural and casual. While we are always trying to f***ing fill up every space--the space between the notes--they play the most amazing things like they're just hooverin'." At that point, he made a gesture that I later learned (from the English-to-American dictionary) was a back-and-forth vacuuming motion. 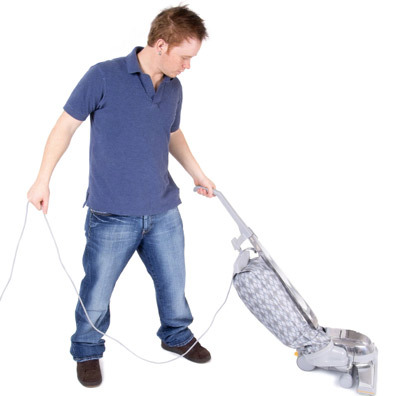 (Apparently "Hoovering" is a reference to the Hoover brand vacuum). He wasn't referring to the mindless repetition of vacuuming--he was explaining that for these musicians, playing this amazing music appeared that easy. Relaxed. Not frantic. There was no desperate need to fill all the space. Some of the best musicians, I'm told, play fewer notes than you actually hear. They play in such a way--and leave enough space--that your mind fills in more. (Granted, it was a DeadHead that told me). Artists know that negative space carries weight. It is not simply an absence of content. The "white space", as it's sometimes referred to by graphic designers, IS content. And it's not just the forgotten stepchild of a composition... it is a first-class citizen. A thing that deserves as much (if not more) focus as the apparent subject of the work. Comedians say that "timing is everything." But by "timing", they almost always mean "the pause." The PAUSE is not merely a void between the Things That Matter. Newbie writers (like me) are taught that it's the words you cut out that matter most. We're told to edit until nothing else can be removed. That's great advice, and when I have time to edit (rare for a spare-time blog post, but required with a book), I start hacking off all those extra words. (Like, "off all those"). But removing words isn't enough. We must insert space. Space for the reader to become engaged. Space for the reader to reflect, process, and co-create the meaning. And they can't do that if we're filling all the space--pushing content out like a firehose. Newbie teachers/trainers often make the same mistake. We fill in every available space, just like those first-time desktop publishers who "abhor a vacuum" and cram words and clip-art into every square millimeter of a flyer. But real learning takes place between exposures to content! Long-term memory from learning happens after the training. The space between the lessons and practice is where the learning is made permanent. If we don't leave that space, new content keeps rushing in to overwrite the previous content, before the learner's brain has a chance to pause, reflect, and synthesize the proteins needed for long-term memory storage. * A software company that adds features so quickly that users never have a chance to organically evolve their use of the app in a way that nobody imagined. Obviously this depends heavily on the type of product, but figuring out the ideal "space for user evolution" is one of the tricky parts. Note: this is not necessarily the same as featuritis--where the company adds too damn MANY features and hurts usability. This is about introducing things based on current use of the product without allowing time for new uses to emerge. * A church that fills every space of a service... conducts every prayer... never allowing the member/attendee a chance to reflect. * The graphic design that allows no white space, or does not respect the "weight" of that space. * The movie that explicitly describes every detail allowing no room for personal interpretation. Where every character says exactly what they're feeling and thinking. * The article or blog post that just keeps hammering... relentlessly... without any space for the reader to use their own imagination. Without space for the reader's neurons to do anything but let the words flow by and right back out. Like, say, this one. Oh yes, I almost forgot the reason I made this post. I saw Neal Young at Red Rocks last night. As part of the CSNY Freedom of Speech tour. And yeah, they were definitely Hooverin', letting us--the audience--fill the space between the notes. I love this post. I read a decorating book ages ago (Alexandra Stoddard, maybe?) that referred to empty space like extra bookshelves and bare corners as "Zen space," there just to be there, not for any other purpose. You know, what you just said. And yes, a lot of really good songs (especially in jazz) will leave out the obvious notes (like the dominant or tonic at the end of a phrase) and your mind just hears it anyway. And you hear it how your mind wants it to sound -- deep in your heart. I'm just throwing this out here, but I find one of the reasons silence (or space) is so effective is precisely because we always strive to fill everything up. It's surprising. It grabs your attention. Like in The little LISPer or The Little Schemer where they'll say something like "Wow, that was quite a difficult chapter. Now go make yourself a peanut butter and jelly sandwich." with an entire page following dedicated to peanut butter and jelly stains. Another writing-related example comes to mind. It's not just about removing the words you don't need. It's also about adding plenty of paragraph breaks to let the words and ideas breath and sink in. When I crack open a novel and see a whole page or page and half of text without a break, I uncrack that novel pretty quick. I've always felt this way about many things, but could never quite express it as you did here, so thanks for that. 1) With sensei #1, it almost seemed like he was holding something back when he taught certain techniques. I always thought that he didn't want to teach us some trade secrets or something. I really struggled for about a year with executing a take down, and when I finally figured out what I was doing wrong, it turns out he knew the whole frickin' time and didn't tell me! I thought he was a real jerk at the time. 2) Sensei #2 would "fill the empty space" as you would put it. He'd explain every technique down to the last detail, essentially laying it all out in front of us to absorb. Of course, at the time I liked sensei #2, because I *wanted* to know that stuff. I had that *just tell me everything* attitude, and he gave me what I wanted. In the end, it was sensei #1 who gave me what I needed, which was the chance to discover things on my own. It changed the whole way I think about teaching and learning. Now when I teach people martial arts(or anything for that matter), I always remember to leave stuff out for students to figure out on their own. An venerable maxim beautifully stated, Kathy. Excellent comments, too. Want to hear some incredible musical spaces? Listen to Count Basie. His single notes and rests create such a swing it's uncanny. I have noticed that one mark of a Very Good Speaker is that she uses silence as effectively as words, something I find very difficult. Great post, Kathy. As I was reading it I thought of the movie "Alive". It's about a rugby team whose plane crashed in the Andes in 1972. Since I am a self-proclaimed movie addict who typically watches a movie a day, I have seen many MANY plane crashes. No matter how spectacular the visuals or music in any of them, however, they will never compare to the crash in "Alive". Right at the most climactic point in the movie when you would expect loud music, faster tempo, frantic camera work everything goes completely silent except for the sound of the wind. It's hard to explain in words. Even now I'm getting chills just thinking about it. White space can be a very powerful thing. On the other end of the spectrum, you have composers such as Shostakovich who composed music that sounds simple, flowingly elegant and easy to play, but are in fact some of the most musically complex and challenging pieces for performers to this day. Shostakovich was fairly liberal in his social and political standpoints, which often put him at odds with the Soviet Union. He was forced by the Soviets to write stiring, patriotic music that would be straightforward for rural orchestras and ensembles to play, so in response he composed elaborate masterpeices that his Soviet oppressors beleived fulfilled their goal, but were playable by none but the best. "I shall state silences more competently than ever a better man spangled the butterflies of vertigo. " I can't find the reference quickly so hope I've got the details right, but I remember reading about an experiment where they gave two sets of students the same lecture. The only difference was that with one of the sets of students they missed out about five minutes worth of content and gave them a few minutes in the middle of the lecture and a couple of minutes at the end and told them to look through their notes in that time. They tested the students on the material several weeks later, and the students in the group where they had been told five minutes less worth of stuff, did way better than the students who had actually been told more. Great post, I just did one of my first technical trainings, and in hindsight, I’m guilty of not leaving enough space. At least not intentionally. There is a medium which, in its mainstream expression, completely depends on white space–comics. The spaces between the pictures, that’s where the action happens, where the reader imagination is engaged the most. Scott McCloud explains this in “Reading Comics”–which is one of my all-time-favourite learning experiences. He explains the history and inner workings of comics in a comic, just brillant. I agree 100% on the importance of "empty spaces," but I've received a certain kind of critical responses to a series of young-adult novels I've published. "You should explain more how X works..."
"The book didn't give enough description of the other characters X, Y and Z..."
"Why didn't you go into more detail about the subject of B..."
While I want to pare down the amount of exposition, some readers/critics only ask me to FILL the "spaces" in the narration. 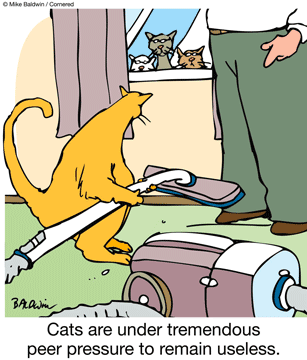 It's as if they "fear a vacuum". Are they really unhappy with the "empty spaces", or am I misreading the critics' intent? Au contraire Kathy - I am all ears. Notwithstanding their weaker second album, Travis are perfectly acceptable to me since they comply with the code of the ultimate guru on these matters. I speak, of course, of Joe Pesci as featured on the soundtrack of My Cousin Vinnie. During the seminal track “Take Your Love And Shove It“, he harangues the backing band to "roll" rather than "tinkle". Rolling music has a inner dynamic that allows for spaces. Tinkling music has no self-confidence and tries to fill every available space - think jazz-funk, the worst aspects of modern r n b and the noodling bed-wetting bands to whom I have referred before. Pescian logic has implications for every aspect of life and is naturally analagous with your excellent post. I found this article made me *reflect* on my Philosophy Prof Phil McShane, who spent days on the Debussy quote (He was really into the Philosophy of Music. The spaces between are nearly forgotten in today's world. It had left my consciousness. Thanks for the reminder. On another note, I hope that Neil Young's show was better for you than me. He headlined a big show with Oasis near Toronto a few years back. It was one of the first reunion shows with Crazy Horse and I watched three, 15 minute musician self gratification sessions, loosely based on his songs, with his back to the audience. It was less like hoovering and more like he was having a massage. I left, even as a part-time musician I found that it was unengaging to say the least. This is very true. Those that doubt, listen to, and watch, Miles Davis when he performs. His space-to-noise ratio is canted heavily toward the space side, but that space is full, of reverberance, of implication, of what he just said. Printed text is a little different. White space is definitely still important, but how it is used is vital. Having lots of white space because of many, many small (or one-line) paragraphs is distracting, and blurs the text/page boundary too much. This is made even worse by having large spaces between lines within paragraphs, as many web-pages do. Having blocks of relatively dense text, with a line of white space between, does a few things: it brings a reader's focus to those paragraphs; it presents ideas or components of an idea, in discrete chunks, more easily digested; it lets the user find a place to pause between your idea-chunks without getting lost on the page. This isn't a criticism of this site, by any means. Just an observation on how screen presentation can guide or distract. Great site! Please wriite as often as you have time to. I'm reminded of the classic 1964 movie "Fail Safe", which ends with you staring, in shock, at a blank screen, in silence, for what feels like an eternity. No end credits. No music. Nothing. Great post. The other thing that came to mind while I was reading it was the quote by Michael Porter that "The essence of strategy is choosing what not to do." In other words, pursuing all possible options sounds like a great idea, but you end up not doing anything well. Choosing a strategy is a matter of choosing what is really important to do and letting the absence of the other parts really let those stand in focus. It's easy to do everything (that's the simplest algorithm) but hard to make choices (which is why there is value there). This also jarred some things in my brain about the fantastic mind-blowing book Godel, Escher, Bach by Douglas Hofstadter which has a section on figure vs ground making a similar point in a different way. Thank you! I loved this blog! I teach dance (to adults ... West Coast Swing), and the space between the steps is the most important thing! The silence/space is so active and alive! It definitely separates the true artist from those who are trying to force results. Wonderful article, approaching a Zen-like attitude towards presentations! I wrote a much shorter, more focused article on silence in presentations in my own blog a while back here, but yours is much more thorough! "Newbie teachers/trainers often make the same mistake. We fill in every available space, just like those first-time desktop publishers who "abhor a vacuum" and cram words and clip-art into every square millimeter of a flyer." My favorite example is the hidden arrow in the FedEx logo. PS: you inspired me to STFU yesterday. Ultimately it is the interpretation that can make a simple piece of music seem stirring as opposed to dull. Just as two different comedians telling the same joke can get different reactions from the same audience. I think that is what you're trying to get at with this article. It is about flow. It is about nuances. It IS about allowing the spaces in between to remain there and not be filled in with distractions that do not add to experience, but can distract from it instead. Years ago I had the unfortunate opportunity to hear a talented impressionist fail at attempting to be a comedian for this very reason. Her impressions were great, but she failed to allow enough time between the setup and the punch line for the jokes to sink in with most of the audience. It wasn't until the show was over that many if any began to see the intelligence and humor in her act. I haven't heard or seen her since. And thanks for the many great posts. 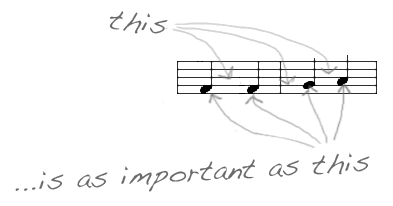 Keep them coming between your pauses (rests).